I hate having to put out the hat, but I'm more than a little broke at the moment. My ball python, Zuko (shown with my niece Shali), is having shed issues that have defied several snake-obsessed friends, so it's vet time. Guess what's not cheap? Exotic vets. My pain doc checked out for Dec/Jan, and won't refill my pain meds until I have an appt, at the end of the month. I've had to use alternative treatments, which aren't cheap since insurance doesn't cover non-pharmaceuticals. I also saw my new PCP today, and I have an estimated $80-100 in prescriptions for stuff like, oh, my blood pressure, thyroid, and psych medications. First, The Obligatory Disclaimer: Tarot and/or Oracle card readings are for entertainment purposes only. Obligatory Disclaimer #2: No refunds. I'm a self-taught Tarot reader with approximately fifteen years experience. My methodology can be unusual and whimsical, but I follow what feels right for the cards. For complicated/intensive readings, I request a consult e-mail or text chat (Discord, FB Messenger, etc). There is no charge for this. The reason I ask for this is so I can get a better "feel" for my potential client. It also allows me to discover what they hope to get out of the reading, which means I can follow up with questions, and discourage unrealistic beliefs, if applicable (such as Tarot being fortune-telling or accurate divination; it is more accurate to call it a self-discovery/empowerment tool,). Overall, it provides an opportunity for both individuals to consider new ideas, make plans, and get to know one another a little better. This is also when a potential client (or me!) should bring up any potential issues or concerns. I'm going to introduce the spreads I'm offering, and afterward, I'll go into how exactly this works, and answer what I imagine are some likely questions. This is an excellent spread for entering the New Year, as this is about taking inventory of what affected the client badly in 2017. It focuses around how to let go of these things, moving on, embracing one's own life, and looking to make the most of the future. It will do so via sledgehammer; there are likely to be parts of your self come to the surface you don't like. That is part of the process of becoming the best you can be in the New Year — and where you are going from here on forward. Consult: Optional. I can do this without, but if you'd like me to have more context for your question, I can work with that, too. Basically, what it says on the tin. One question, one card, my interpretation, that's it. This one is not done live, and I will e-mail you the card drawn (or by chat, if preferred) and my interpretation in relation to the asked question. If no question asked, I will instead give a brief description of what the card can commonly mean. "Past, Present, Future" is a standard three card reading, but this link suggest other options; feel free to choose an alternative. I found this spread, and I happen to adore it. I see a lot of spreads about finding love, or about relationships, but it's less common to see one so very to-the-point about loving your own being. Personally, I love this spread. It is, however, rather to the point. It is also more complicated to work with than one might think. I often have to draw a number of clarification cards, and in a couple cases, I had to start over with a revised question. This is a surprisingly informative spread designed to help identify an ongoing problem in one's life, and may bring up some harsh and painful memories and emotions. Please be aware of this in advance. Okay, while the Celtic Cross is commonly one of the first spreads a new Tarot reader learns, it's actually rather complex. That's because, even more than the other spreads I have listed, the Celtic Cross does not let any card stand alone; they are all connected, and often in a quite subtle fashion. It is a spread that is easy to learn but difficult to master (I won't even claim to be a master; I've just worked with it enough to be familiar with its quirks and such, but even then, sometimes I get whammied). This is something I came up with while playing around. I'm sure there's someone else out there who's thought of it, too, but this is what I call my version. I pick two decks that will work together (... some do NOT play nicely), and I usually use the Celtic Cross for a basis. I will draw one card from each deck for each card position in the spread. There are several reasons I do this. For one, many decks have "specializations," so to speak. Also, spreads for certain individuals can call for the duality between the two decks. Or, as I've seen a time or two before, while one deck had pinpointed part of the answer, there were still questions — and the other deck is what provided them. It is, certainly, an unusual solution. Some ask why I don't simply draw two separate spreads like most would, and that's because if I do it that way, I miss the connections between the two decks in the context of that spread — which sometimes can be the exact reason that I felt called to choose a mirror deck in the first place. This is one of my most advanced spreads, and thus meant to address complex questions/situations. It's also the most intensive of what I'm offering, and I price it as I do because of the complexity, the labor I put into it, and because it's the most exhausting. ★ WHAT HAPPENS IF THE READING GOES OVER ESTIMATED TIME? Nothing. Well, except for that I'll probably have a skull-splitting headache. Usually, if this happens, it's because the question the deck answered led to more questions, or because the situation was unexpectedly intricate and complex. It's just part and parcel of the craft. Now, if the session runs over by a fair bit, and the client is satisfied with the reading and would like to add to the PayPal tip jar? I won't complain. ★ WANT A DIFFERENT SPREAD? You can either check out my Pinterest Tarot spread collection — https://www.pinterest.com/elialshadowpine/tarot-spreads/ — or if you have one in mind I haven't listed, feel free to contact me (info below!) and ask. ★ SO, HOW DOES ELIAL HANDLE LONG DISTANCE TAROT READINGS? Currently, I don't have a private space appropriate for video chat, but I still perform the reading over text chat, of which I have several. I will throw the initial cards for the chosen spread, take pictures of the spread and individual cards and send them over text chat, and from there I will start to begin the interpretation, again, by text. Questions at any point are absolutely fine. I often end up drawing more cards than the spread indicates, for clarification purposes. If there's something nagging for more detail, by all means, tell me, and I'll draw another card. As long as it doesn't get into the territory of "absolutely ridiculous," we're fine. ★ WHY NO VIDEO CHAT? Because of house layout, my bedroom is where I would have to hold a video conference; under less chaotic circumstances, I'd have a private area set up, but it's not possible right now. For what I hope are understandable reasons, I am less than comfortable video conferencing with perhaps total strangers in my bedroom. There are two exceptions to this. Folks who know me well enough to be on a special filter here on FB / LJ / DW / etc: You know how to get in touch with me, go ahead and drop me a note. We'll see. The second exception is: If you do not know me personally, but you want a video conference for a reason important to you, e-mail me (contact info below) with basic info about what you're looking for in a reading, and why video is a priority for you. Don't worry, you don't have to put together a PowerPoint or anything, just give me an idea of what's going on in your head. It could be that the reason is a common misconception, or it could be something that is definitely important. If I agree to a video conference, there will be an additional fee of $30 for all readings under 1hr long, and $50 for all that are longer. This is because of the additional stress, anxiety, number of things to focus on, extra exhaustion, and frankly, it's simply not my preferred method in the first place. "Why are your prices so high? People on Tumblr and Twitter only charge $5 for Tarot readings, or they do them for free!" My answer to that is: By all means, please take your business in that direction. 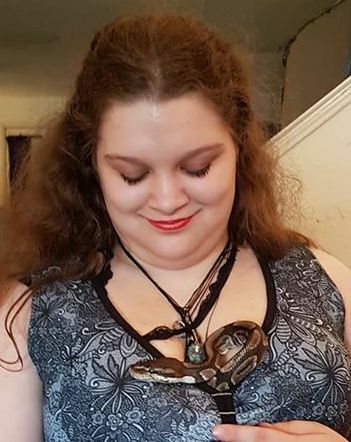 I am raising funds for medical care for my poor, sick snake, and medication for myself. I'm offering a range of spreads, at varying prices, and I chose those price points based on the amount of time, effort, expertise, and raw spoons go into a given reading. If you, or your friend, or some other person, can do it for you, for less, do what's right for you. I am not the reader for everyone. Seriously, if anything about my practices annoys or bugs you, please just keep scrolling. I won't be offended. Bright blessings to you. Okay, if you've read through all this stuff, well, first, grab a handful of cookies from the Magic No-Allergy No-Calorie Nothing-But-Delicious-Noms Cookie Jar — and if you're interested in having a reading done by me, I can be found below! If you're interested, or even just curious, here's my various contact info. Please let me know that you saw this post, if you friend me on social media to send a message. That way I know you're not a fake spam account. ;) Again, any questions welcome! Note the Second: This post is public, so feel free to share and signal boost far and wide! Thank you all!